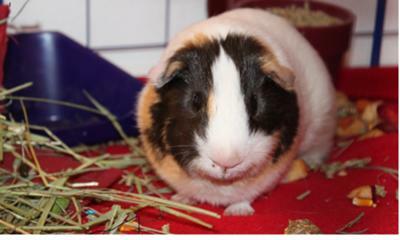 "Harley "is a a sweet peruvian Guinea adopted at Petco and is very vocal and affectionette. She loves hay and parsely and most kinds of fruit, but has to have her carrots stemed. Spoiled? Yes! Cute? Yes! Loved? Yes, yes, yes! She was first thought to be a male, thus named "Harley Davidson" but after a weekend being chased down by my sons guinea pig "Hammy" we realized she was a girl. She is now named "HarliQuin" after mushy romance novel. But we call her harley! Brankica: I can only imagine her being chased :) They are so crazy in pairs! Did you have any babies after that? Or are they fixed? Love her she is gorgeous! Peruvian guinea pig has straight hair, several inches long. It takes a lot of time to groom this pet. Described in simple words his hair falls from the top of the body to all sides. Click here for all breeds and colors of guinea pigs.